The magnetic whiteboard size is 17''x11''. Can be used as a grocery list, a shopping list, a calendar, an office board, a menu, a message center or simply as a drawing board for kids. It has has been built using advanced technology, therefore is one of the best on the market. CLEANS EASILY even after long periods of time. Tested successfully after 30 DAYS All included items are magnetic and stick well on metal surfaces. As a bonus we offer 1 BIG MAGNET (1.2'' diameter) with high end glossy finish and high grip, to hold your pictures or messages in place. ✅ 1 YEAR WARRANTY - NEW PREMIUM MATERIAL - STAIN RESISTANT - NO WRINKLES - EASY TO ERASE - The dry erase white board has been successfully tested for 100K write-erase cycles. It is covered with special coating and can be easily erased even after 30 days. We offer a 1 year warranty on the board surface and we guarantee it will keep it's properties in time. 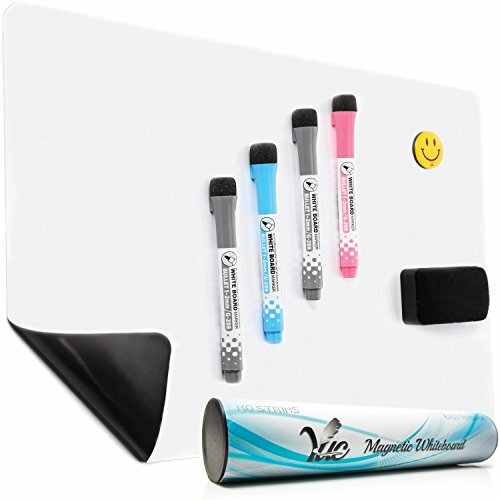 ✅ HARD GRIP - NO CREASES - EASY TO HANDLE - The magnetic whiteboard has strong grip on steel surfaces and because of it's thickness it does not to make creases when handled. It can hold magnetic items when placed on the refrigerator, freezer or other metal surface, and because of it's nicely finished rounded corners it can be easily removed. Is is very flexible, and easy to fit on the fridge. ✅ VALUE PACK - ALL MAGNETIC - STRONG TUBE - Includes high quality writing tools (2 black, 1 red and 1 blue) and a large magnetic eraser. All packaged in a nicely designed and strong tube to be protected on their journey. ✅ BONUS - ONE FREE small fridge magnet (1.2'' diameter) with strong grip and high end glossy finish, to hold your photos or notes on the refrigerator. If you have any questions about this product by Yuc, contact us by completing and submitting the form below. If you are looking for a specif part number, please include it with your message.